This page includes links to all of our Drainage and Land Drainage DIY how to projects. The projects are targeted at the most common drains-related questions we get here at DIY Doctor, such as plumbing for baths, showers and basins waste, unblocking the same, land drainage techniques and solutions, fitting waste disposal units etc., but if you don't find a related project to solve your problem, don't forget to try our very-active advice forum. Please browse through the below list and click on your chosen link to view the project information. Drainage - foul water and surface water - Understand your home drainage systems - foul water, surface water and sewers drain from your home. Find out how drains work. 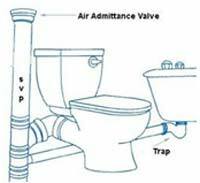 Drains - unblocking toilets, sinks and baths - How to unblock a toilet, unblock drains, pipes and basins, clearing a toilet, clearing drains. The following pages will deal with the different types of drainage involved in the home. They can be divided into two main categories. Foul water drainage and surface water drainage. Many people do not know that joining to, or altering sewers or drains on their property is sometimes subject to building regulation approval. These drain and sewer runs appear on drawings which are part of the property lease and any future owner of the house, or maintenance engineer from the council, has the right to know where the drains and sewers run in order to solve any problems caused by blockages or broken sewer pipes. It is worth noting that the difference between a drain and a sewer is that a drain serves the property it is connected to whereas a sewer is usually a connection of drains from several properties. Foul drains (above ground these are called sanitary pipework) carry water and waste from toilets, baths, basins, bidets, dishwashers, washing machines, kitchen sinks and showers. These drains run to foul water sewers which carry the foul water to sewage works for treatment. Foul water can be passed through foul manholes and inspection chambers to treatment works and can also be stored in cess pits where the effluent is filtered and pumped out periodically. All foul drainage must be vented to outside air at some point in the pipe runs and the rules for this are covered in approved document H of the building regulations. These are available from the Planning Portal. The gasses from foul sewerage can build up and are potentially explosive and poisonous. Surface water drains carry water from the roof (this can be in the form of snow also) and other hard surfaces such as driveways, paths, footways and patios. Water on the lawns and gardens is also surface water but this is more often dealt with by land drains.